← The Girl in the Road made the Locus List! 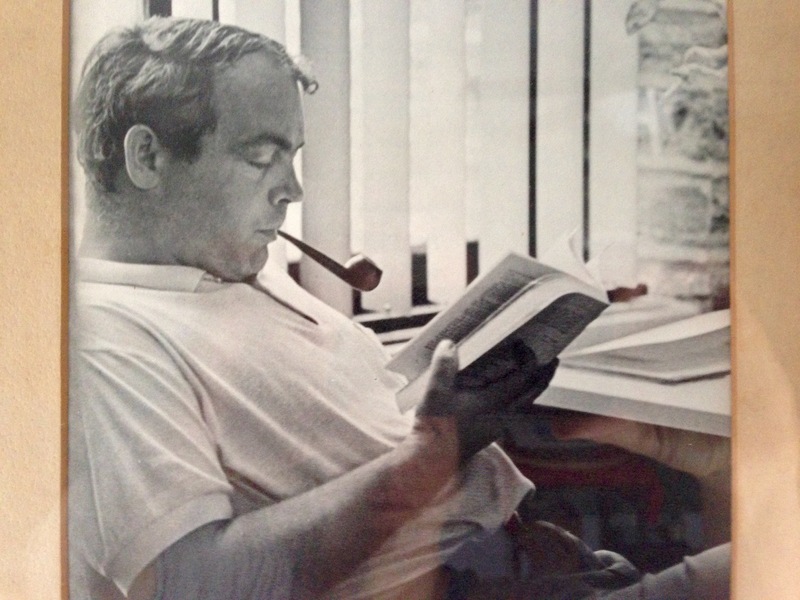 Photo: my Dad in his library carrel at Duke, circa 1970. My sister Clare recently sent around a sheaf of poems written by Dad, out of the hundreds he wrote over the years he raised us, taught religion, and took care of Mom. This one, “Murph,” was published in the literary journal West Branch. It’s about Dad’s seminary friend who committed suicide after being rejected by a woman he loved. Somehow, to me, in the way only poetry can, it explains so much about Dad, about our Catholicism, about why I am the way I am. Thank you. I’m finding it difficult to distill everything brought up by that photo, your story, and your father’s poem. The sight of your father reclining in that generic mid-century university library chair, absorbed in his text – well, my own father was a medievalist at Vanderbilt and that image brought back in an immediate and visceral sense the smell of brick and chalk and most of all, the paper and glue in the stacks and stacks of books lining the walls and covering every horizontal surface of his office. Your father’s expression could well have been the same one mine wore as he walked across campus absorbed in the latest Commonweal or the National Catholic Reporter. I suppose that what I am trying to say is that I’m grateful to you for having shared as much of your life as you have and allowing us to discover those odd coincidences and experiences that tie us all together. And manly man cis-male that I am, I freely and without reservation admit that I did sqee when I saw your RT of the new Ghostbuster’s cast photo. Thank you so much for this, Jacques. Our fathers seem to be made of the same cloth, so to speak…sons of Vatican II. And you’re welcome, of course. I’m so glad it resonated with you, and I know my Dad is, too. mcb, ima RT this! but guess what: that pic is actually in a library carrel at Duke’s Perkin’s Library!–probably 1969-70.